You know how important it is to set up your company’s boot and shoe program, and you may have already taken the first steps to getting your workers properly equipped, but starting the process can feel daunting. What types of boots and shoes are appropriate for your workplace? How do you balance cost and quality? Which brands are the most trustworthy? 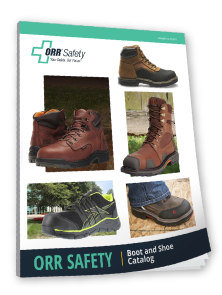 At ORR Safety, we have put together an easy-to-navigate catalog of the best shoes and boots for every job, featuring 30 brands and 12 different categories of boots. Lots of workplaces have very specific and obvious boot and shoe needs, but most have multiple environments their workers may be operating in. Our catalog includes simple graphics that indicate what features each boot or shoe has and for which types of workplaces they are best suited. Steel Toe - Absorbs up to 75 ft. lbs. of impact and up to 2,500 lbs of compression. Required by OSHA in areas where employees are exposed to injury due to falling or rolling objects. Composite Toe - Non-metallic safety toe caps perform like steel toe safety shoes but weigh roughly 30% less. Great shoes for electronic security work environments. Metatarsal Guard - Protects both the toes and the metatarsal bones behind the toes. Commonly used in foundries, welding, air product distributions and other heavy manufacturing. Conductive - Protects against the hazards of static electricity build-up. Ideal for hazardous work environments that deal with explosives, flammable liquids, and flammable gases. Electrical Hazard - Protects the wearer from open electrical circuits of 600 volts or less under dry conditions. Perfect for maintenance, welding and engineering positions. Postal Certified - Manufactured according to USPS 89 and meet sole slip resistance, domestic source end product, water resistance requirements. Puncture Resistant - A flexible steel midsole underneath the foot reduces the hazards of puncture wounds caused by sharp objects penetrating the sole. Slip Resistant - Outsole compounds reduce the risk of slips and falls in wet, oily and/or greasy work environments such as restaurants and hospitals. Waterproof - These shoes and boots have been treated to prevent the penetration of water ultimately keeping your feet warm and dry. We don’t take safety lightly. All of the boots and shoes in our catalog were carefully chosen because they are the best for each workplace and application. Setting up your company’s boot and shoe program is an important step in maintaining a safe and OSHA compliant workplace, so learn about what a good boot and shoe program entails, contact one of our safety experts, and download our Boot & Shoe Catalog today!